What a busy, yet fun summer for the Grubbs family. The Grubbs caravan rolled through Grand Rapids this last weekend for the 2013 Meijer State Games of Michigan. I had never been to this event before, but what a great tournament. 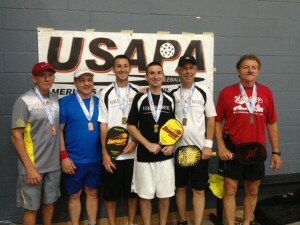 We played at the MVP field house where there were 15 pickleball courts taped off on 5 basketball courts. What a great facility to host this big of a tournament! Over 250 players signed up to compete for the titles. Friday night my wife Abby, Dad, AKA “Rocket”, and I all drove up to Grand Rapids to check out the facility and set up our vendor tables for the tournament. Saturday play began at 8:00am. Abby and I were the only ones in the family playing on Saturday in the mixed doubles open division. Unfortunately Abby wasn’t feeling very well so our mixed doubles day was pretty short. We played two good teams in Marsha Koch / Tom Wells and Carolyn Ebbinghaus / Bart Ford, so we got to watch a lot of really good pickleball. Sunday was the mens doubles. My brother Zack and I were registered in the OPEN doubles bracket. We knew we would have to play well to have a chance at a medal. Just our luck, we got to play last year’s Gold Medalist in Bart Ford and Jeff Christmann. What great players. Somehow we managed to eek out a win and move on. We ran up against another great team in Jim Hackenberg and Paul Colletta, but somehow managed to come up with the shots when we needed them. So Zack and I managed to keep on advancing until we got to the finals. Waiting for us in the finals was none other than the Rocket himself and his partner Jeff Siebert. They had a great run of their own. Rocket and Jeff had lost in the first round to the always great Paul Sprainitis and Pat McPhail, then clawed their way out of the losers bracket to make it back into the finals. We have played Dad and Jeff 100’s of times back in our hometown of Brookville so we knew it was going to be a tough match. After a lot of back and forth rallys, Zack and I were able to pull out a hard fought win 11-8, 11-8. Great way to end a tournament. It doesn’t get much better then that getting to play pickleball and hanging out with friends and family all weekend. SO YOU KNOW WHAT? LETS DO IT AGAIN NEXT WEEKEND!